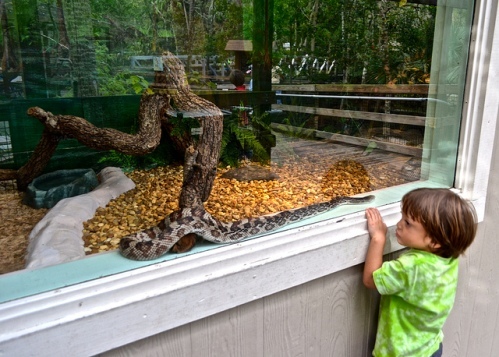 Homosassa Springs Wildlife State Park is a park unlike any my family has visited. In fact, with nonstop wildlife sightings, the park is much more like an interactive zoo than a park. My family and I recently checked out the park while we were visiting Crystal River, Florida’s Nature Coast. The Ellie Schiller Homosassa Springs Wildlife State Park is dedicated to the rehabilitation of injured and orphaned West Indian manatees until they are fit to be returned to the wild. The centerpiece of this rehabilitation center is a first-magnitude freshwater spring, which produces millions of gallons of crystal-clear water each hour. Its spring outflow is the one that creates the Homosassa River. The Ivan Tors Animal Actors used Homosassa Springs Attraction as home to their trained animals when they were not appearing in movies and TV shows. One of the most popular trained animals was Buck, a black bear who was a stand-in for Gentle Ben in the television series. The hippopotamus named Lucifer first came to the Homosassa Springs Attraction in 1964 as part of Ivan Tors Animal Actors. Lu is now one of the park’s longest residents. He celebrated his 49th birthday in 2009. In addition to the four resident manatees in the spring, the park has rehabilitated manatees from other facilities on a temporary basis. 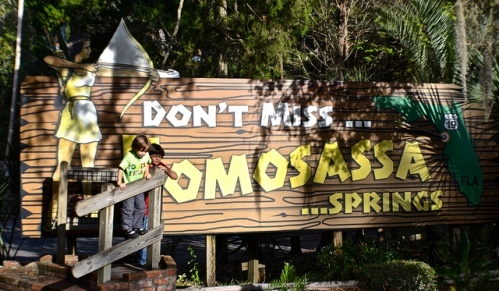 Homosassa Springs has been a tourist attraction since the early 1900s. It all started when trains started stopping to let passengers rest at the spring. The 50-acre site and surrounding 100 acres was purchased in the 1940s and started operating as a small attraction. In the park’s early days as Homosassa Springs Attraction, the emphasis was on entertainment. The rehabilitation aspect was left on a side. From 1978 to 1984, the land exchanged hands under several private ownerships. In December 1984, the Citrus County Commission purchased it. They considered it an environmentally sensitive area. Today, Ellie Schiller Homosassa Springs Wildlife State Park is owned by the state of Florida. The Park is proud announce their two recent additions: a new Shore Bird Aviary and the new Homosassa River Walk and Manatee Observation Area. 1. Boat Tours – These are included in the admission. The tour takes you from the Visitor Center to the West Entrance to the Wildlife Park along Pepper Creek. 2. 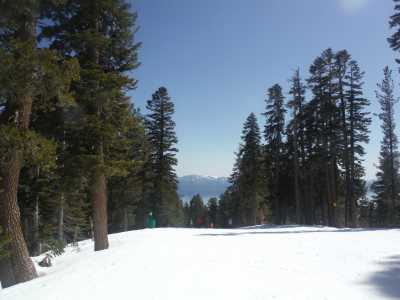 Hiking/Nature Trail – The trail is 1.10 miles long. 3. Reptile House – You get a close-up view of a few snakes and reptiles. 4. Visitor Center – In it you will find exhibits like: U.S. Fish & Wildlife Service’s Manatee Education Center and Florida Fish and Wildlife Conservation Commission’s Migratory Bird exhibit. There is also a display on the history of Homosassa that runs along the inside wall. If you still want more you can check out the diorama that shows what the town of Homosassa looked like in the early 1900s. 5. 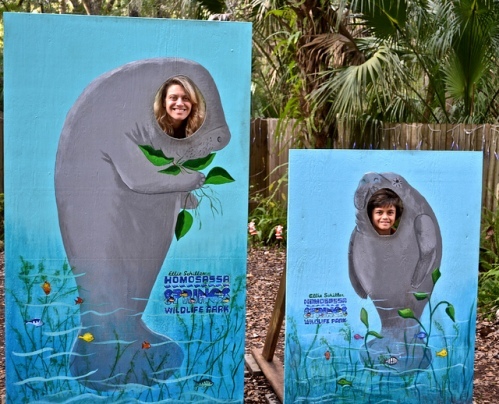 Underwater observatory – If you’re running with some luck you will be able to see manatee from it. We were only able to see turtles and schools of fish. 6. Train – A boat ride and also a train can take you to the main entrance. Both are included in the entrance fee. If you have small kids I recommend the train. It is faster. We took the boat in and when the tired kids were whining to go home, the train was a great alternative. Admission Fee: $13.00* Adults. $5.00* Children, 6 -12. *Includes state and local taxes. Hours: The park is open 9:00 a.m. until 5:30 p.m., 365 days a year. The last tickets are sold at 4:45 p.m.
Manatee Program – 11:30 a.m., 1:30 p.m. and 3:30 p.m. – presents an informative program on the history of this endangered marine mammal and general information on the wild manatee population. Wildlife Encounters – 10:30 a.m. and 2:30 p.m. – it introduces an example of a native Florida species, which may be a bird of prey, an opossum, a gopher tortoise or a non-venomous snake.